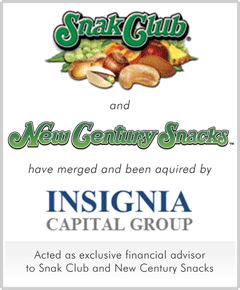 Snak Club and New Century Snacks ("the Company"), is together one of the leading manufacturers and distributors of nuts, trail mixes, dried fruits and similar snacks. M&A Capital's relationship with the Company spanned nearly a decade prior to being engaged, assisting the company in various capacities, including strengthening its management team and developing a board of advisors. When the Company's shareholders decided it was time to consider its strategic alternatives to generate liquidity for certain shareholders at retirement age, and to secure growth capital, M&A Capital targeted a broad universe of financial and strategic partners. Already having a strong understanding for the Company’s operations, M&A Capital was able to go to market quickly, focusing on firms that could provide shareholders with the highest value while also ensuring a good relationship going forward. Ultimately, the shareholders chose Insignia Capital as the partner best suited to take the Company to the next level.